As Miley Cyrus is preparing for her new album project, she has been seen spotted out with singer K. Michelle, amoung others. The singer was recently spotted with Memphis rapper Juicy J, whom she exchanged tweets with after hanging out at a night club. 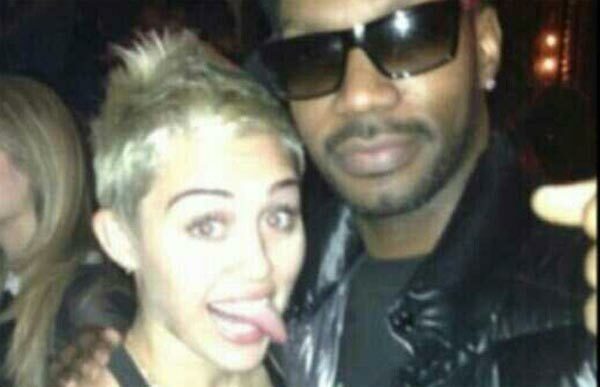 In the tweets shared between the two artists, rapper and producer Juicy J told Miley Cyrus he had a ball at the club. Prior to Juicy J tweeting about the two hanging out at the night club, Miley tweeted that ‘this record is getting crazy’ followed by a list of twitter account names which included Juicy J. We wonder what these two artists may be working on. Meanwhile, Miley Cyrus, who’s working on her fourth studio album, has been said to be already working with the likes of Pharrell Williams, Eminem, Kanye West and Jay-Z. @mileycyrus I had a ball at dat club lets turn up again! Along with the new music Miley’s working on, the singer also revealed a picture of herself with a new tattoo of two arrows pointing in opposite directions on the back of her right arm. The news of Miley’s new tattoo and new music comes after the revealing news of the singer wearing some hot, red lingerie for the new movie So Undercover, as reported on MusiqQueen.com.